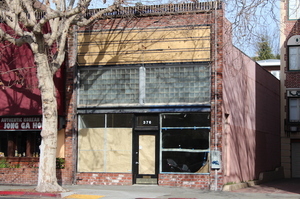 Bay Grape wine shop’s upcoming home. Photo courtesy of Josiah Baldivino. Josiah and Stevie. Photo via Bay Grape website. I was thrilled to hear the news that the vibrant husband-and-wife team Josiah Baldivino and Stevie Stacionis found a location for their wine shop, an idea they have been fine-tuning of late. Baldivino is the head sommelier of Michael Mina restaurant (he has worked there the past four years), and if you have attended any tablehopper Languedoc wine events, you’ll know who he is! Stacionis is the director of communication for Corkbuzz Wine Studio in New York, Community Manager for the Guild of Sommeliers, and you have probably seen her writing on Serious Eats. They also created a fun video series, A Drink with Friends TV. So, the shop! It’s going to be called ~BAY GRAPE~, and it’s right on Grand Avenue on the northern edge of Lake Merritt in the Adams Point neighborhood of Oakland (in between Uptown and Grand Lake). The 1,800-square-foot retail space is going to be filled with wine, craft beer, sodas, and a selection of local and artisanal charcuterie, cheese, nuts, pickles, and bread. You can take things to go, or open up a bottle and create your own little picnic at the communal table or the counter. It’s meant to become a community gathering spot, and they are working with a local designer to create an inviting space that’s full of light (bonus, there are skylights and tall ceilings! ), with pale wood, and corrugated metal finishes. Now, here’s a big reason why I love these two. Baldivino has some serious wine chops: he worked for Silverlake Wine, as a sommelier for the Daniel Boulud group, received his Advanced Sommelier Certification, and was also named one of Wine & Spirits’ Best New Sommeliers. Stacionis has worked front of the house for seven years at restaurants in Minneapolis, Los Angeles, and New York, is a Certified Sommelier through the Court of Master Sommeliers, and has quite the background both in editorial and in wine retail communications. The two of them love pouring wine, drinking wine, and writing and talking about wine. They love to educate people about wine, but are far from snobs about it. Quite the opposite: they make it very, very fun. Come by during the week and you’ll find themed pours by the glass, plus two local wines and a local beer on tap. There will be plenty of winemaker tastings, informal classes, and even CSA pickups. Look for an opening this summer! 376 Grand Ave. at Elita, Oakland.